On the Tuffalm is no place for boredom! You can spend some quiet of relaxation on our sun terrace or let yourself be pampered by our cordial service, while the kids explore the petting zoo and the big playground. On hot summer days you can reach the Völser Weiher in about 30 minutes and cool off in the refreshing water. Or would you like to extend your hiking tour and explore more of the National Park Schlern. Then just stay in the Tuffalm for a while before you continue your journey and taste some delicious, home-made delicacies. 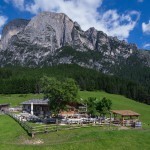 The Tuff Alm is also a very popular stop on longer hiking tours in the Nature Park Schlern. Within a time radius of 1 hour, many mountain pastures, hiking trails and mysterious caves can be explored. Get to know old witches’ legends, interesting stories of hermits and other legendary figures. You can follow a path through a beautiful forest and reach the “Migghöhle”, a cave where the hermit Franz Migg lived in the last century. On the other hand you can follow a trail to the Hoferalpl mountain hut, where you can admire the magnificent view over the stunning landscape. Just come and experience the beauty of the mountain world yourself!